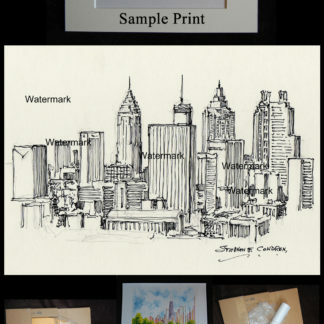 View cart “Atlanta Downtown Skyline Pencil Drawing At Night #815A” has been added to your cart. 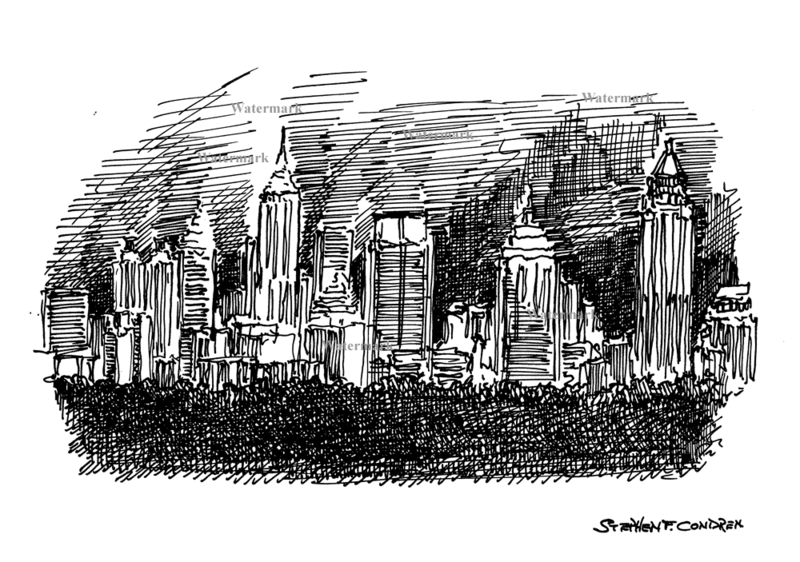 Atlanta skyline #821A night skyline pen & ink drawing. Atlanta skyline #821A pen & ink drawing of downtown at night, which is for sale here, at discount with prints by artist Stephen F. Condren, BFA, SAIC, of Condren Galleries, a Fine Arts Gallery, offering JPEG & PDF prints. 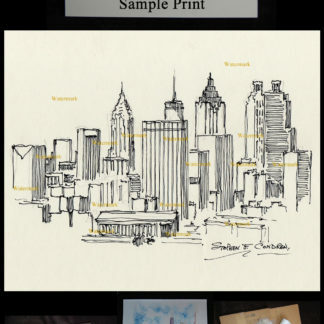 The focus of the drawing is on the center business district, or the downtown, of Atlanta. 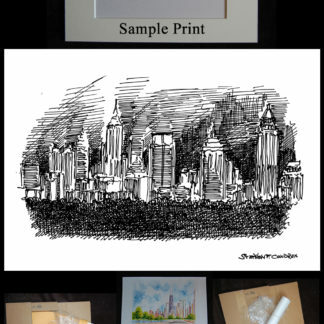 Because Atlanta skyline #821A is great, it’s prints are great! 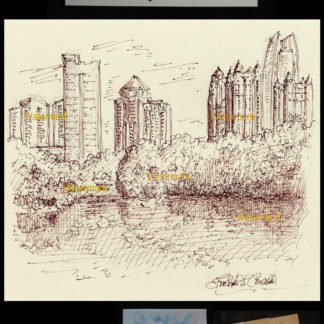 This lovely cityscape of Atlanta skyline #821A is done at night. 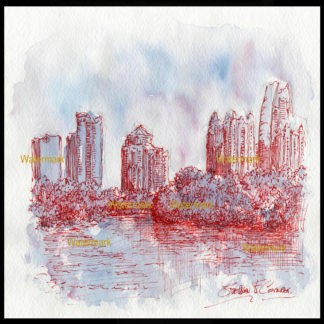 The time of day is the beginning of sunset which eases into twilight as time passes for Atlanta skyline #821A. 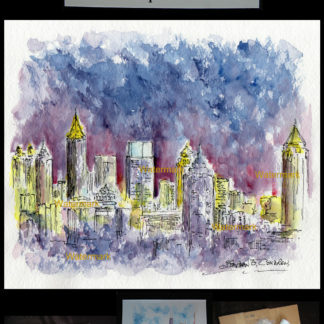 The time is night and the lights of the evening streets glow in the background for Atlanta skyline #821A. 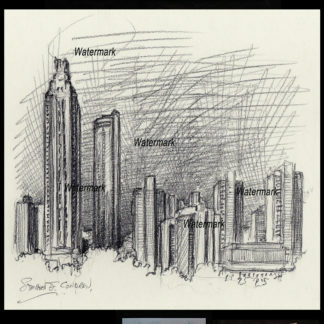 Atlanta skyline #821A is an example of the outstanding artwork of Artist Stephen F. Condren. 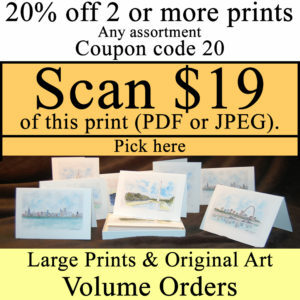 Atlanta skyline #821A is a fine example of artwork at Condren Galleries. 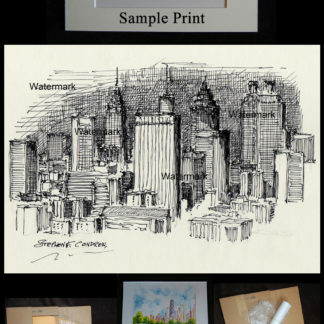 I have chosen a medium pen tip to produce the form of the buildings and the shade & shadows that make up the composition of the drawing. The drawing is completely done free-hand with no use of mechanical elements. The time of day is at night. 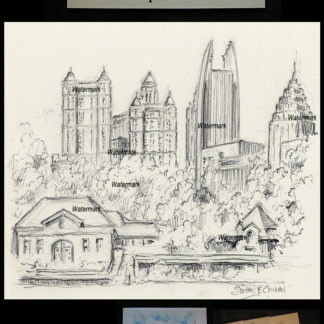 Because Atlanta is from the south, it has a deep and rich history that few others can match. She was built a beautiful city and rebuilt a beautiful city from the ashes of the Civil War. Now, more than ever, we as Americans need to look to Atlanta for answers to you heritage as a country. Most importantly, Atlanta is a city of education and culture.